Butternut squash is another vegetable that I had never tried until recently, and again, I’m making up for lost time by making it often, especially in the fall. 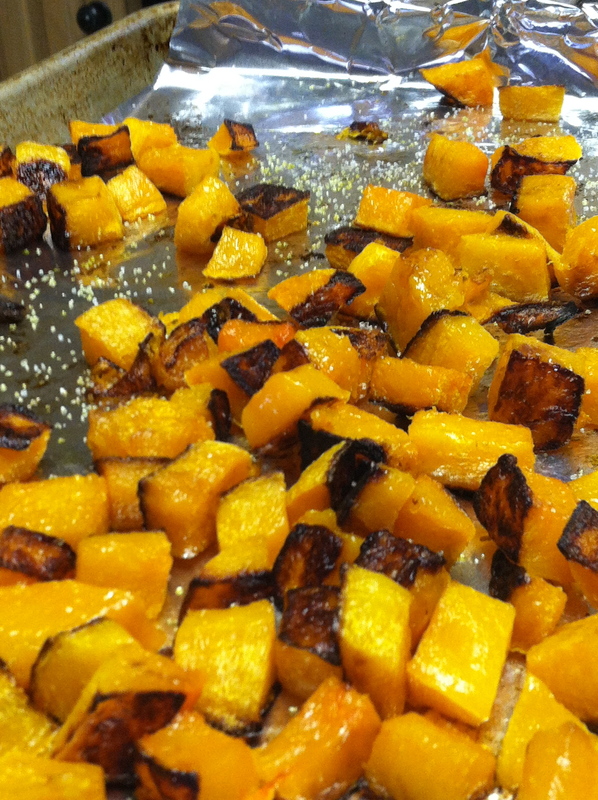 This yummy squash is like candy…..so sweet and yummy, and I find it incredibly easy to polish off a whole pan in one sitting. My kids know if they want some squash they had better grab it before I devour it. I like my squash to get pretty brown on at least one side (see the picture above), so I let it roast 10-15 minutes to start, then stir gently a few times during the remaining roasting time. Test it often the last 10 minutes or so…..you want it soft, but not mushy. This is an easy veggie to feed your kids….the squash has a nice, mild flavor, and roasting it really brings out the sweet flavor. Even my pickiest veggie eater likes roasted butternut squash, so give it a try! Holy YUM! That looks absolutely amazing. I’m printing out the recipe. I think I might sprinkle some cumin on, and see if that works out. Thanks very much! I bet cumin would be great….let me know how it turns out!